Thanks to George Foster for information about the following SCAW fundraiser. Homerooms were challenged to raise money for at least one bed (there are 29 homerooms). The reward for the most successful homeroom was cake for the entire class. Homerooms were all given one plain cake. The task was to decorate the cake in a wonderful way. The best cake won the chance to throw cake at the team members at an upcoming assembly. Those decorated cakes were auctioned off to the highest bidders. Parents could order cakes for their sons/daughters' birthdays. They're still baking! So far, they have raised $1250.00 (in one week!) and are very proud of their accomplishments. They'll make this donation to SCAW at their December winter assembly. Jennifer said she thinks the tangible nature of the "bedkit" really galvanized the students and inspired them to give money. 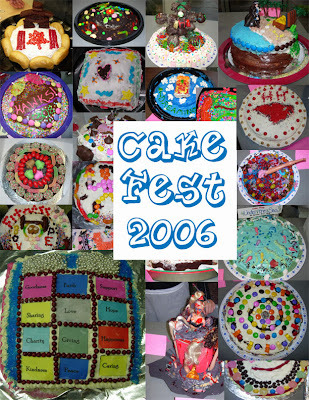 One team member has created the wonderful picture shown above — a compilation of all the decorated cakes. Thanks to Lina DiMatteo for letting us know about the The Society of Management Accountants of Canada [CMA] charity campaign from October through to December, 2006. They will have various events in their office throughout the three months to raise money for Sleeping Children Around the World. Gary Spark in Winnipeg raised money for SCAW in an unusual way. In September, he sent an email to several of his friends asking for their support which we posted here. Well I finally made it before the good weather ran out. On Sunday, September 24th I rode 106 km from my home in Winnipeg to Lockport which is 53 km north of Winnipeg and then back home. I left home at 7:30 AM and arrived back home at 6:00 PM. The trip out was relatively easy but on the return I was facing head winds of 35 km. Very tough. I have eaten enough protein bars and drank enough Gatorade to last a lifetime. Also did a lot of stretching exercises along the route which seemed to help. The thought of a cold, very cold Corona beer when I got home. Picturing the smiles on the kids we were going to help. The overwhelming support from everyone who pledged money. What a great, great group of supporters. Everyone was extremely generous and we raised $675. WOW! Each and everyone of you should feel very proud. The children's photos will take 4- 6 months but I will email them to everyone. Please forward your pledge by cheque payable to me. I will forward the total to the charity. Here's the deal. 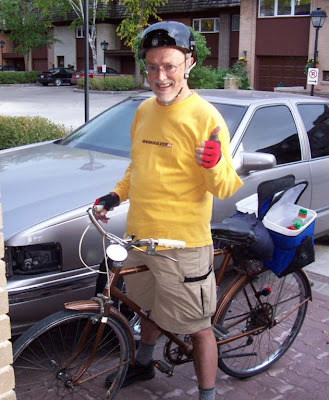 Before the end of Sept, 2006 I am going to atempt to ride my bike from my cottage in Victoria Beach, Manitoba back to the city of Winnipeg which is 100 km. I have been thinking of doing this for many years. I have procrastinated enough. And after a fantastic recovery triple by pass heart surgery this is the year to do it. It really is a wonderful example of how charities should work. What I am asking each of you is a donation to SCAW upon completion of at least 100 km. You can decide to donate an amount per kilometer or a lump sum for the whole trip. I know someone is always trying to pick our collective pockets, at work, at home, on the phone and at the mall. I have only sent this email to my friends who have the biggest hearts and are very generous. So dig deep. Donate $30 or more and you'll get a photo of a child with your name on a bedkit photo. Thirty dollars is just a good bottle of red wine! Who am I kidding $30 buys me 4 or 5 bottles of wine. Whenever I make a donation to charity I feel so great and you will too. Winston Churchill said, "We make a living by what we Get but we make a life by what we Give." Donald and Esther McGugan are long-time donors to Sleeping Children Around the World. To celebrate their 60th Wedding Anniversary this weekend in Bradford, Ontario with friends and family, they donated sixty bedkits to Sleeping Children Around the World. "We have received the sixty pictures for our anniversary donation. They will be distributed to those attending our party — each with a notation about SCAW and its work. The pictures from Uganda are the best we have ever received — bright, colourful backgrounds throughout. Uganda is a special to us in that the Watoto Children's Choir from Kampala has been in concert at our church on two recent occasions." St Clement Church is hosting a fund raiser for three charities, one being SCAW.